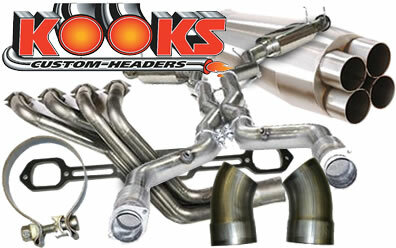 Kooks Headers has been making headers and exhaust components since 1962. With the introduction of its legendary Fox-body Mustang headers, Kooks quickly became the top choice of late-model Mustang owners. And now traditional small block Ford owners and late-model GM LS enthusiasts alike prefer Kooks exhaust components, too. Kooks’ complete line of exhaust components includes headers, header collectors, exhaust tubing, and mufflers for GM, Ford, Dodge, and specialty race applications. Plus, the company offers bolts, gaskets, flanges, clamps, O2 fittings, and more—everything you need to complete your custom exhaust build.